Kia's 2013 Forte compact sedan, coupe and hatchback make a compelling argument for why budget-minded pricing doesn't always equal bargain-basement quality. Stylish, fuel efficient and loaded with features, the Forte line-up offers a thoughtful alternative to the Honda Civic and Toyota Corolla, and for hundreds of dollars less money. 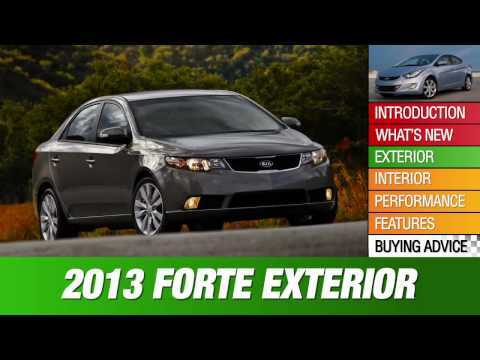 High-efficient 2013 Kia Forte will never fail you. My 2013 Kia Forte is a regular sized small car. It is perfect for me. It is a four door and I am able to purchase groceries and other things that will fit in the back seat. I really love the spacey trunk! I could fit my whole closet into the trunk! I have never really needed all the space, but it is a good feeling to know I have room in my car. This car drives very smoothly. I love the interior lights. You can change the color of the lights inside the car (radio system, dashboard, etc. ) The best thing about this car is gas and mileage. I spend only $25 a week on gas, which is better than a lot of other vehicles. It is eco-friendly, so that is a huge plus!! There are cupholders in the middle of both the front and back areas of the car. In the front, each door has room for a drink and other items. This car is perfect for traveling because it is fuel-efficient and is small enough to Dodge in and out of lanes and fit into small spaces!! I have not been disappointed in my two years of owning this car. My Kia forte is great on mpg. I really enjoy my Kia forte koup. Its a 2013 very stylish body, I prefer this body style better than the newer forte body styles. I purchased it new and it has done me very well with gas, durability and performance. I have made accidents to my vehicle 3 times and had the insurance fix it. Every time I got it fix it feels like new. The mpg is great. I tend to put about $25 in it and it fills up great. I drive a lot and it gets me where I need to go fast and swiftly. I love my Kia forte! Get yours today. I really do enjoy this car. I like that it is smaller in size. It has a nice design and style. It is quite comfortable. My only complaints would be that it does not have much in the way of power. It does get great gas mileage, especially for long trips. I have not experienced any large maintenance issues yet. The Kia dealership has also always been very helpful.